Adding Top Commentators gadget to a blogger blog isn't a new thing to most bloggers. The commentator gadget will help you know the most active user on your blog, as comments is what makes a blog very active. This commentator gadget will be of great help to bloggers who offer price monthly to the best or top comment. You do not need to know to code to apply this gadget in your blogger blog, just need to copy and paste it in your blog "add a gadget". Now let us see not only how we can add top commentators gadget to blogger, but how we will add it with the avatar. 3. Now click on save and you can view your blog, it will show the Top commentators widget. Now you have successfully added the gadget, you might want to edit it the way that you like, so continue reading below. To change the size of the commentator's avatar, search for var sizeAvartar=33 with the number of pixels you want. Now You and I have learnt How To Add Top Commentators Gadget With Avatar For Blogger Users. 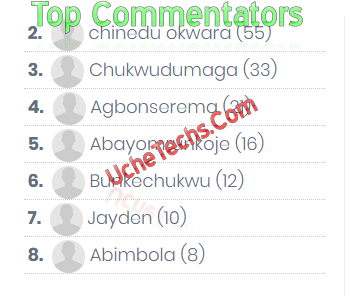 This works as seen in the picture above, chinedu okwara is the leading commentator in this blog, and i am very grateful for your comments guys. To get more Seo Tips and Tricks, drop your email after this article.